The images coming in from NASA’s Juno mission reveal some amazing details of Jupiter’s Great Red Spot, after the probe made its closest approach yet of the giant planetary storm system. On Tuesday, Juno flew 9,000km above the most massive storm in our Solar System, thought to have been raging for centuries. During the flyby the orientation of the spacecraft was optimised for radiometric observations, which probed the depth of the storm, so there was rather a limited window of opportunity for imaging of the central region of the cyclone. Some of the images were taken by JunoCam, an optical camera dedicated to public outreach. At the closest approach to the planet, the camera can view features as small as 15km across, and it has taken some spectacular images of the Great Red Spot during the flyby. The raw images from JunoCam are available for anyone to download, edit and enhance. People can then submit their images to a Juno gallery after some creative processing. The images are amazing, and some citizen scientists have already been hard at work on them. The enhanced red region in this image shows the ammonia clouds covering the central regions of the storm. 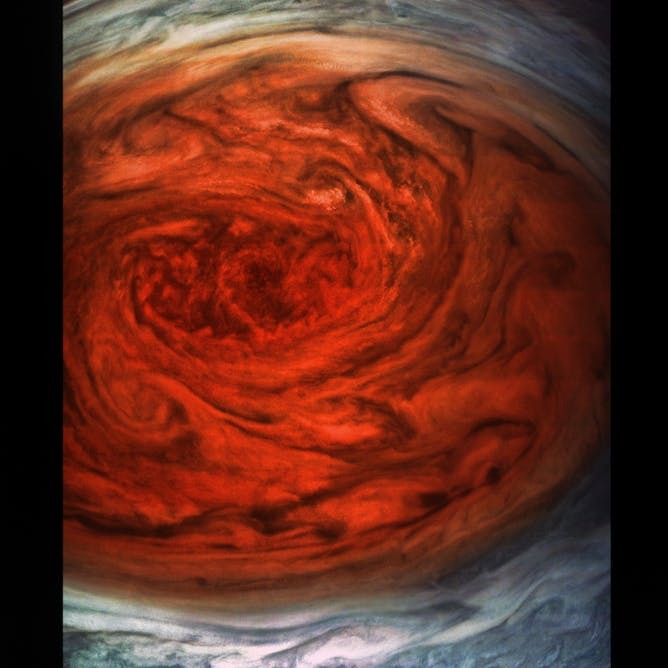 Peering into the Great Red Spot – color enhancements and vibrance, to bring out detail. The enhancements in this image show the interaction of the cyclone with surrounding zonal clouds on Jupiter. Sean Korbitz’s enhancement of one of the Juno images of Jupiter’s Great Red Spot. 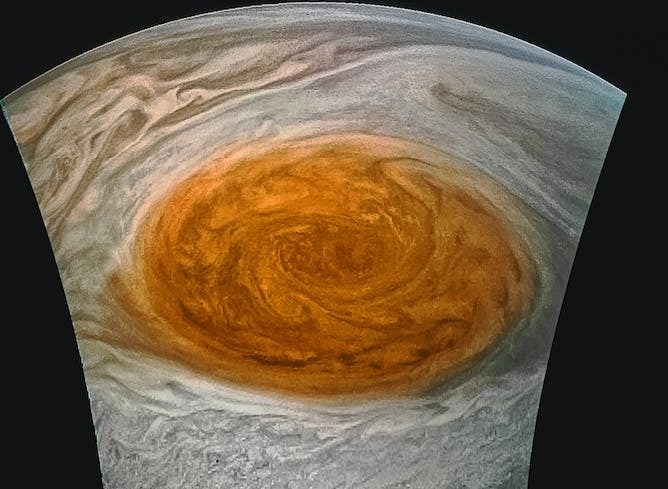 This image gives an unprecedentedly detailed view of the Great Red Spot, with the swirling clouds of different hues and smaller vortices forming and breaking up inside it. The cloud streams of darker colouration are located deeper in the atmosphere than the lighter clouds. Another enhancement of one of Juno’s images of Jupiter’s Great Red Spot as seen by Juno. Citizen scientists are not only involved in processing images but in actual planning of photographic targets for the mission flybys, which are selected by the process of voting. So if you want to see your favourite feature of Jupiter photographed, get involved in target selection for the future flybys. Science has lot to gain from involvement of citizen scientists who bring their skills, passion and time to enhance the imagery from JunoCam. These amazing images not only give us all the moment of “wow!” but also allow astronomers to test their increasingly detailed atmospheric models and predictions. 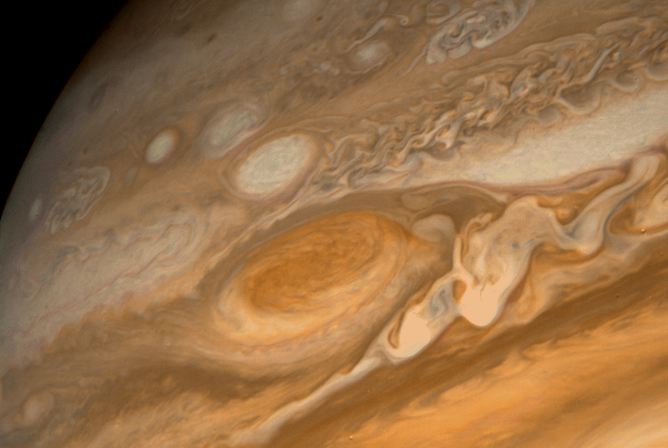 The Great Red Spot is thought to have been raging on Jupiter for several centuries. The giant red feature on the planet was reported in the 17th century by scientists such as England’s Robert Hooke and Italy’s Eustachio Manfredi. 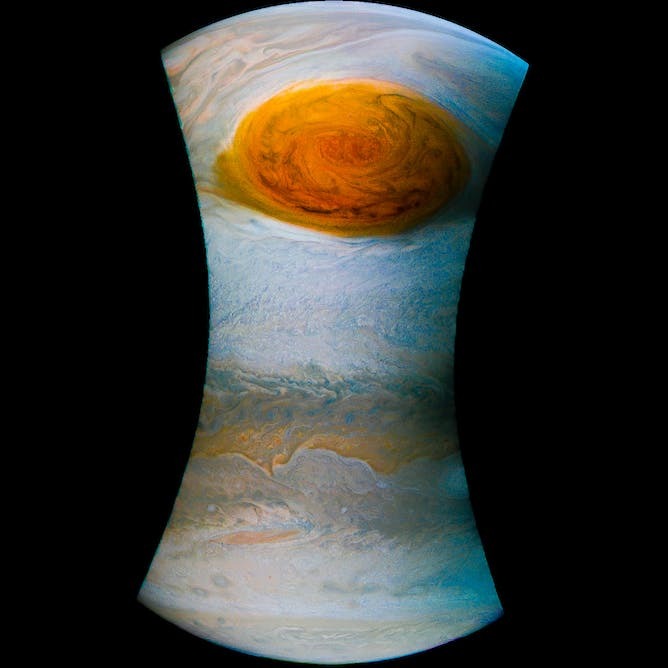 Images taken from space by NASA’s Voyager 1 spacecraft in 1979 revealed the Great Red Spot as a swirling, layered oval of clouds moving in an anticlockwise direction across the Jovian surface along the banded streams of air. Jupiter’s Great Red Spot as seen by Voyager 1. Such a swirling pattern resembles anticyclones on Earth, when the strong winds flow outside and bend around the high-pressure air in the eye of the storm. Cyclones die out quickly on Earth, usually when they hit land, due to friction with the planetary surface. But Jupiter does not have a well-defined surface and its fast rotation – a Jovian day lasts only 9.9 Earth hours – makes any formed cyclones long lasting with ferocious winds blowing at close to 600kmh, almost twice as fast as the fastest cyclonic winds on Earth. The Great Red Spot is exceptional both in its persistence and size – it exceeds two diameters of the Earth. In recent years, though, the Great Red Spot appears to be shrinking and changing its shape. The storm is covered in the thick, cold clouds of ammonia elevated above the surrounding zonal clouds. Data from Galileo mission suggest the Great Red Spot resides in planetary troposphere and does not extend too high up into ionosphere. 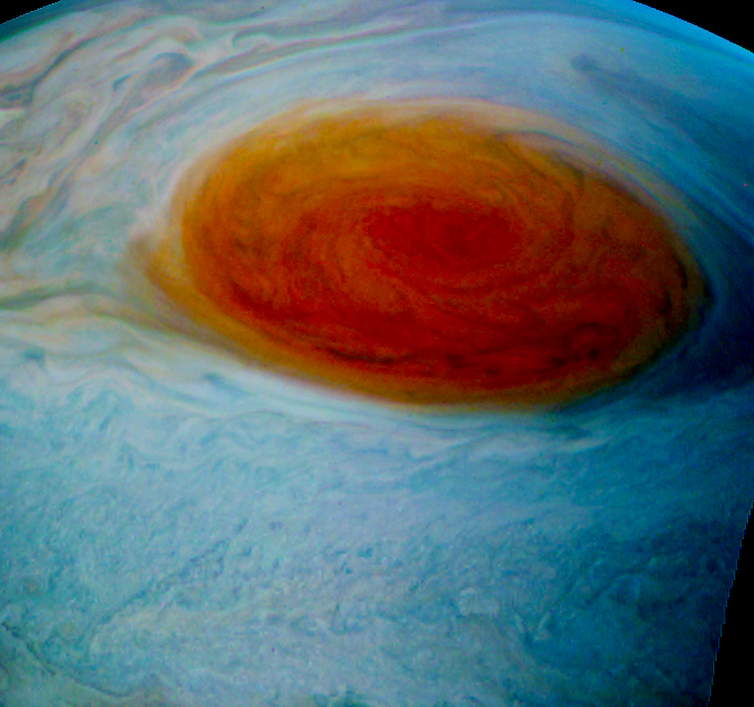 Another enhanced-color image of Jupiter’s Great Red Spot was created by citizen scientist Jason Major using an image from JunoCam. It is not entirely clear how this weather system formed and how deep it is. 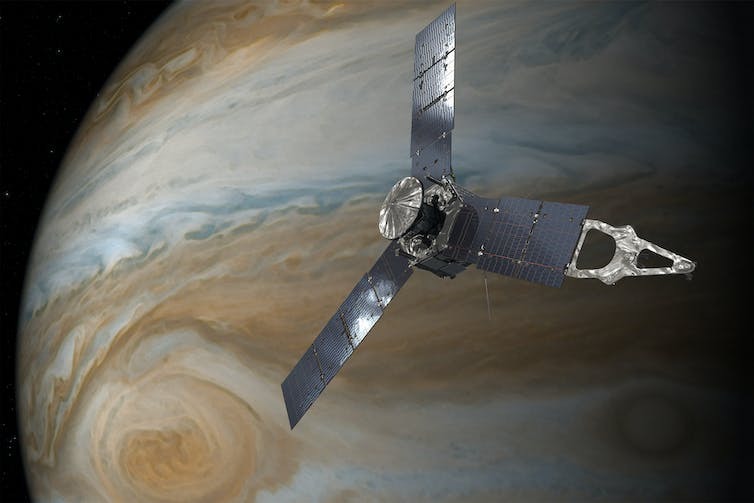 Juno’s six-channel radiometer will answer at least the later question by probing layers of atmosphere up to 300km below the cloud tops. Some sophisticated cloud models suggest formation of this large cyclonic structure due to merging together of smaller storm vortices. There are plenty of them, possibly formed by shearing motion between bands of air moving with different speeds around the planet. Such vortices can also arise due to the warm columns of gas in the surrounding cooler air, powered by fast planetary rotation. In 2000 another, smaller spot, called Little Red Spot was observed forming in a merger of smaller storms, south of the Great Red Spot. The much anticipated convergence of both cyclones did not happen. Another puzzle about the Great Red Spot is its colouration, that changes over years from reddish to almost white hue that blends with the surrounding clouds of the icy ammonia. An illustration of NASA’s Juno spacecraft in orbit above Jupiter’s Great Red Spot. It is not clear what makes the spot red. Hydrocarbons, compounds of sulphur and phosphorus have been suggested to colour the clouds swirling in the storm. Their chemistry is being tested in laboratories with simulated Jovian conditions without much consensus so far. One study suggests that particles of red phosphorus upwelling from deeper layers of the atmosphere above the Great Red Spot cannot produce the very intense red colour that was observed in the past. The current favoured models suggest a layer of ammonium hydrosulfides that can turn reddish in ultraviolet light from the Sun under appropriate conditions. Before the end of Juno mission we should have a much better understanding of compounds that play role in giving Jovian clouds their colour, while the latest approach to the Giant Red Spot should help us to explain what powers this long lasting storm. This article was originally published on The Conversation. Read the original article. Image: The raw images of Jupiter’s Great Red Spot taken this week by the Juno probe.